On our second day in Punta Gorda we decided to do a little road trip towards Sarasota. We decided to stay for dinner at the Tommy Bahama Restaurant Sarasota restaurant. 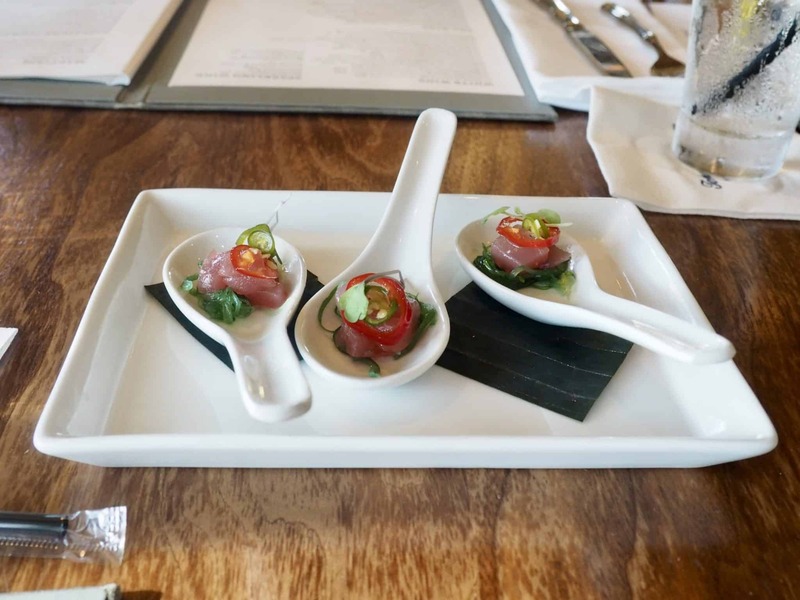 The Tommy Bahama Restaurant & Bar is located in St. Armands Circle, and is minutes away from Lido Key, Siesta Key, Longboat Key and Ana Maria Island. The restaurant features a second-story dining room that has stunning sunset views. Most of the Tommy Bahama restaurants have their store within the restaurant but this is their only Island location where the restaurant and store are under different roofs. Their apparel store is just steps away in the Pink Quadrant at 371 St. Armands Circle. I love the laid back relaxing feel of the Tommy Bahama restaurants. 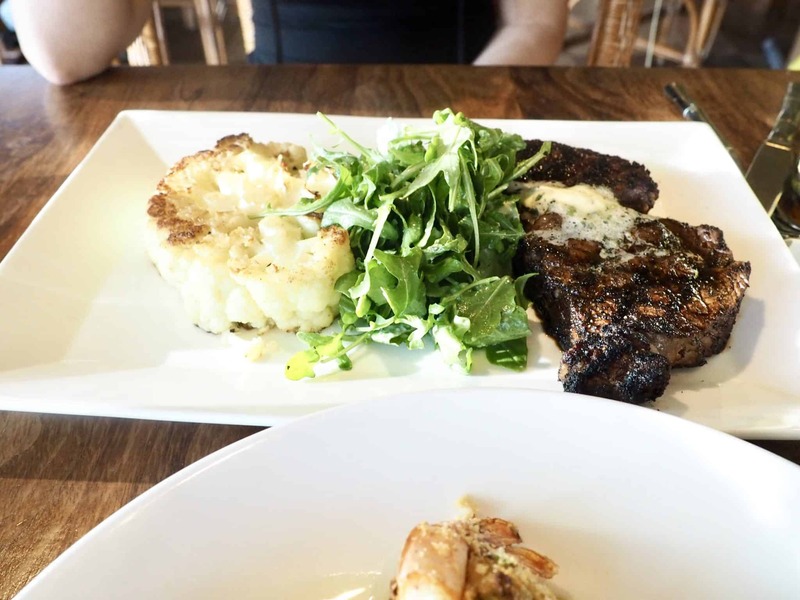 This is not your stuffy steak house restaurant. All the staff are extremely friendly and helpful. With such a tropical vibe I had to continue the theme by ordering a tropical drink. It was so delicious, all I needed was a beach to compliment this drink. 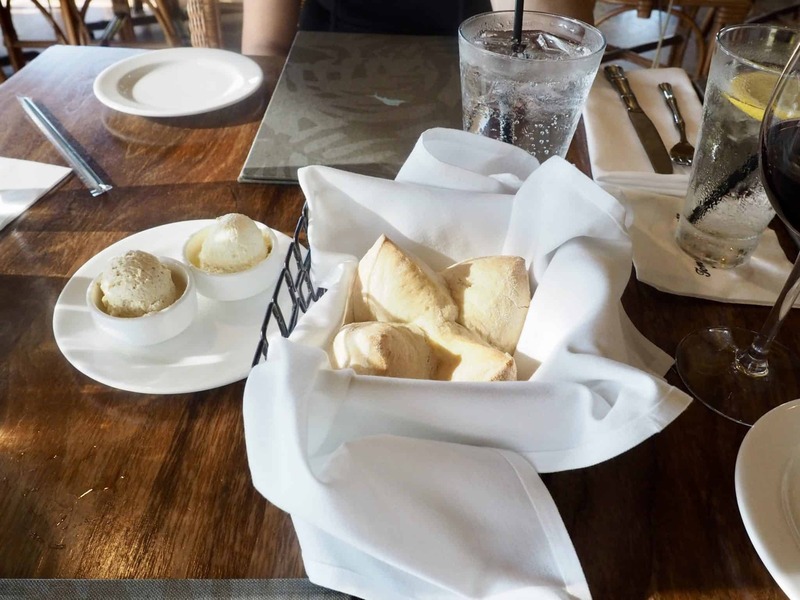 A basket of warm bread was brought to our table with two different butter choices. Plain butter and cinnamon butter – what a delicious combination. We devoured the entire basket. How cute are these chicken lollipops and they were delicious. 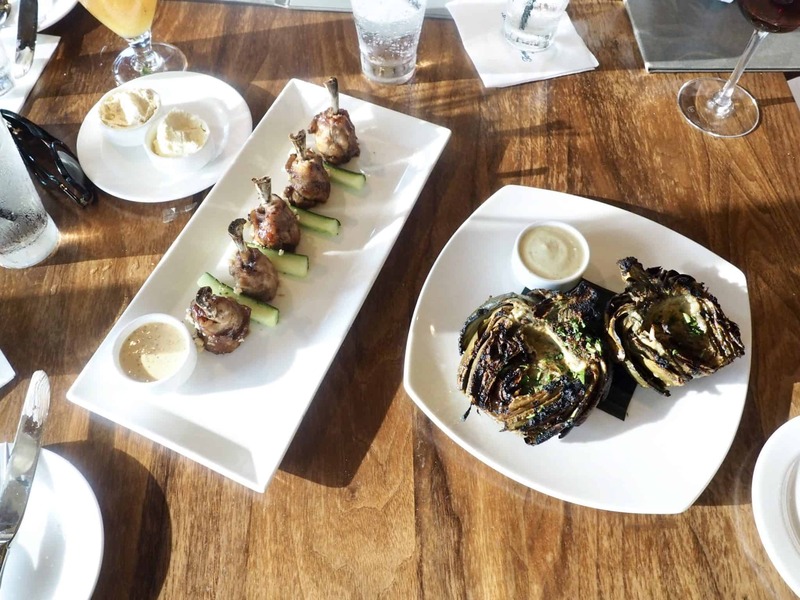 The perfect bite sized appetizer. 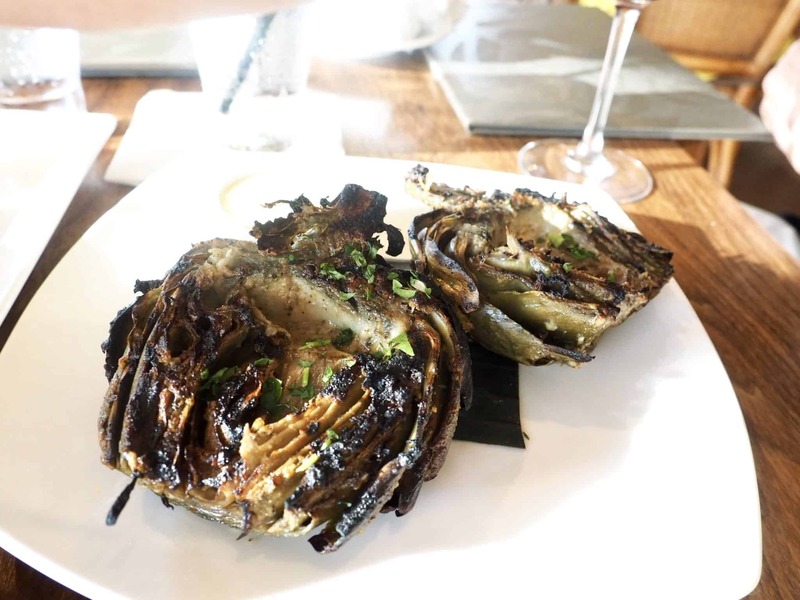 We love roasted artichoke and always order it if we see it on the menu. Being in Florida, I wanted to take advantage of all the fresh seafood items. My daughter loved this combination of crab and shrimp. The fish was light and flakey and the sauce and macadamia nut gave it so much flavour. We have already established that there is always room for dessert, but not just any dessert. These desserts are almost too pretty to eat. To me, their pineapple creme brûlée is their showcase dessert. 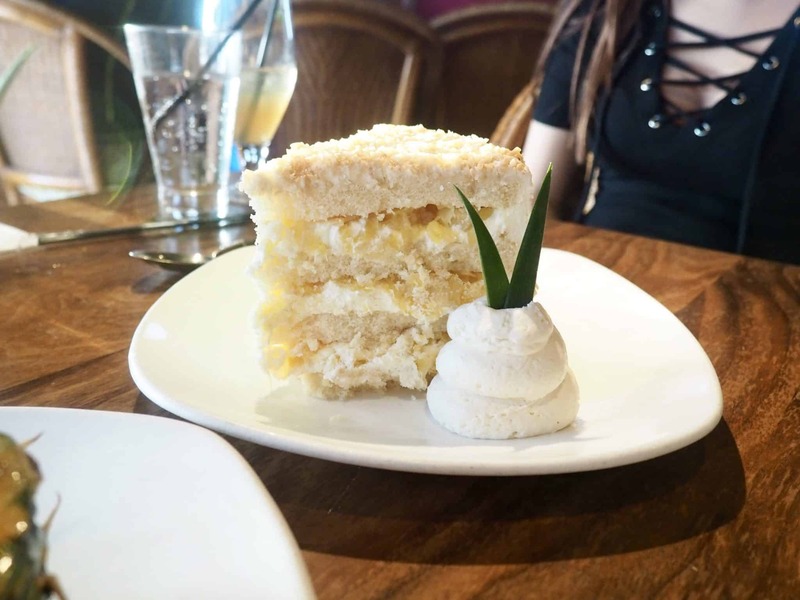 My daughter loves their Pina colada cake. Thank you to Tommy Bahama Restaurant & Bar for hosting our dinner. This is definitely our happy place. 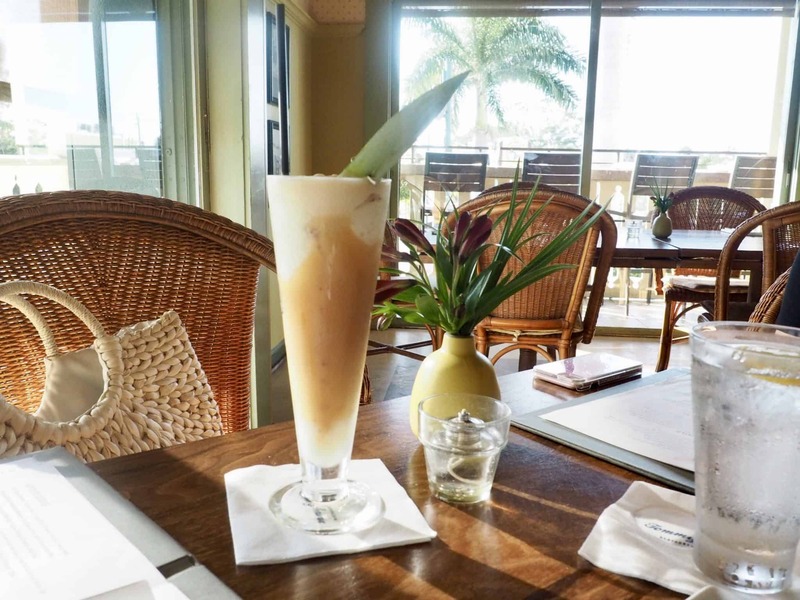 If you are in Sarasota be sure to visit the Tommy Bahama Restaurant & Bar for lunch, dinner, or happy hour. Visit their website for island inspired menu items and their Instagram page to escape the everyday and “Live The Island Life”. 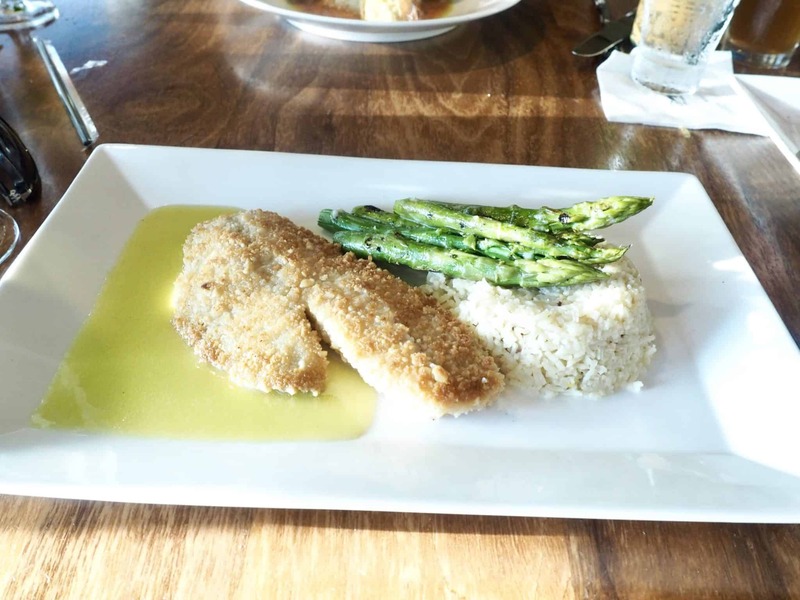 Have you dined at a Tommy Bahama restaurant? Although we were guests of the Tommy Bahama Restaurant & Bar Sarasota, these opinions are entirely my own. Wow, the food looks incredible! I could eat all of that and especially that pineapple dessert. I haven’t tried this restaurant (I’ve never been to Sarasota), but it definitely looks worth a visit. Sarasota is beautiful and has stunning beaches. 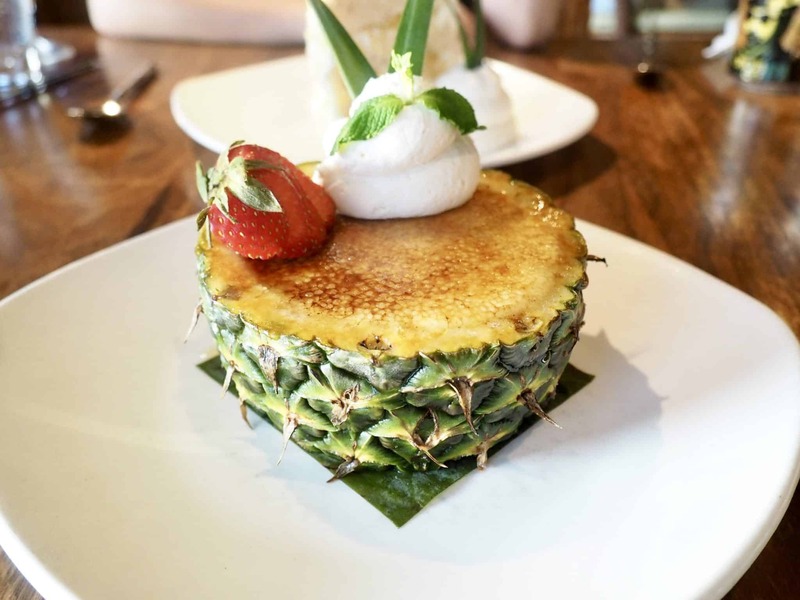 The Pineapple dessert is to die for. Oh I wouldn’t have recognised any of these food if you didn’t give description. So much more to learn… 🙂 They look amazing! That crème brûlée is like a work of art! How beautiful! Is it a real pineapple? It is a delicious work of art. It is a real pineapple that you actually eat and is so sweet like candy. This looks delicious. 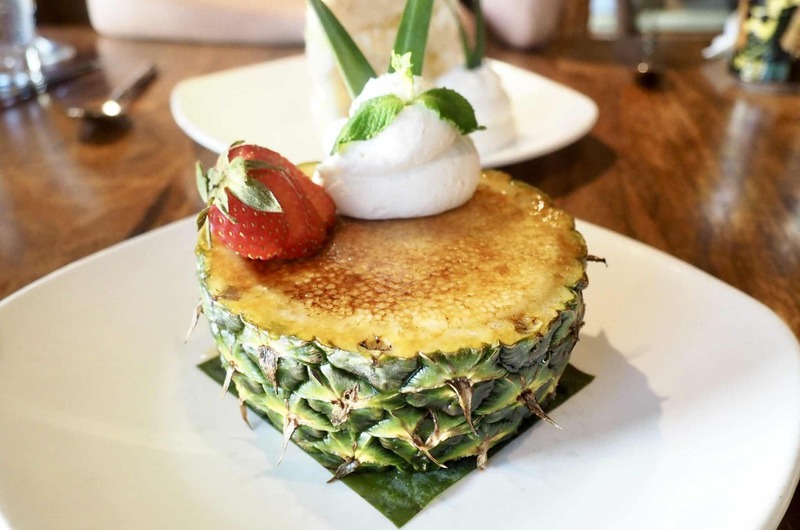 You had me sold at “bread and cinnamon butter.” And that pineapple creme brulee looks incredible! I don’t even like creme brulee and I’d still order it just for the presentation. everything was so delicious -the creme brûlée is a must have. 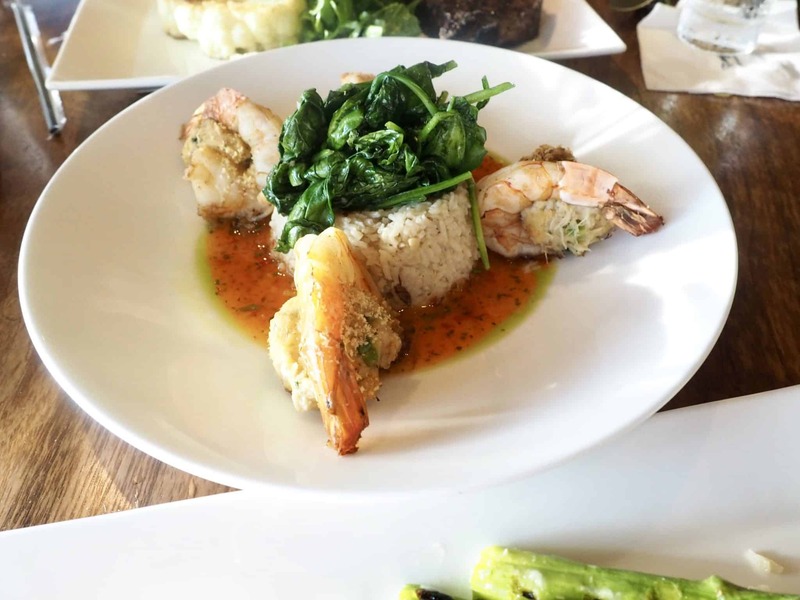 The crab stuffed shrimp looks absolutely delish! What would you say about the prices? Was it affordable? Sarasota is one of my favorite parts of Florida! 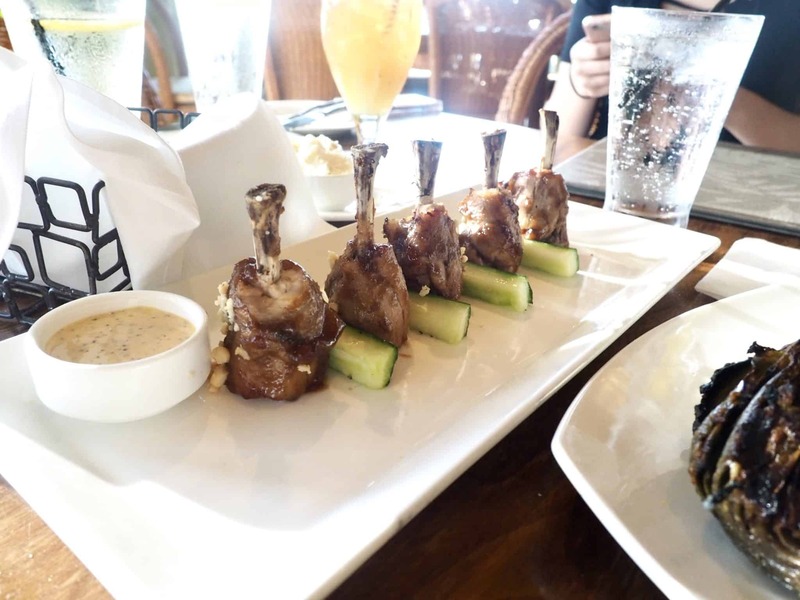 The food looks incredible, and I’ll definitely be adding Tommy Bahama’s to my list of places to eat next time we’re in the area. Thanks for sharing! Looks like a foodie’s paradise, I just wanna taste them all, you have clicked the dishes so beautifully! Definitely a foodies paradise, everything is so delicious. Okay, sign me up, immediately! Not only is the tropical decor right up my alley but everything is plated so beautifully! I have instantaneous poke and artichoke cravings lol. And Cinnamon butter for bread? IS THIS PLACE HEAVEN?! And also, creme brulee is my absolute favorite and the way they served yours is so innovative! I love it!! The cinnamon butter was delicious and the pineapple dessert was so good, I would go there just for the dessert!